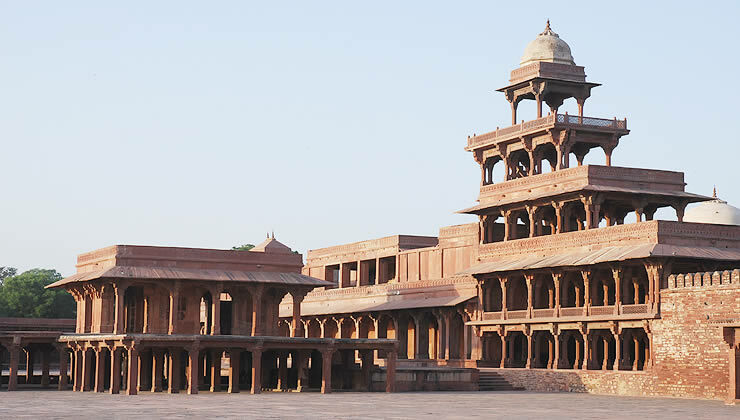 The Pachisi Court, Girls' School, and Panch Mahal of the palace complex at Fatehpur Sikri. 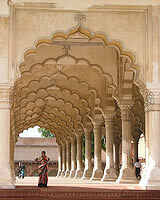 Set atop a ridge, the city of Fatehpur Sikri was founded by the Mughal emperor Akbar in 1569. 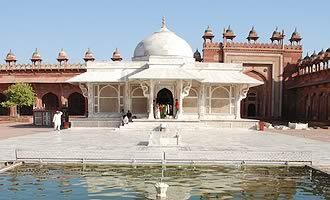 Concerned that he had no heir, Akbar sought the council of the Sufi saint, Shaikh Salim Chisti, in the village of Sikri. Chisti correctly foretold that Akbar would have three sons. The first, Prince Salim (named after the Sufi), was born in Sikri in 1569. The grateful emperor ordered the building of a mosque and palace complex in the city, which he renamed Fatehpur Sikri ("City of Victory") and made the capital of the Mughal Empire, until 1585. Built of red sandstone, the complex's sacred sphere is dominated by the congregational mosque (Jama Masjid) and the Tomb of Salim Chisti. 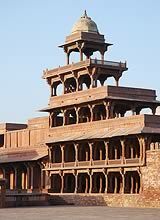 The site's prominent civic buildings include public and private audience halls where state business was conducted and where Akbar held religious councils that led to the creation of his new faith, the Din-i-Ilahi. The harem, imperial palaces, and the houses of Akbar's wives are among the key structures of the complex's residential area, as well as the Pachisi Court, Girls' School, and Panch Mahal. Located in the courtyard of the Jama Masjid, Fatehpur Sikri's large mosque, the white marble tomb is set on a raised platform across from a small pool. It, like the rest of the city, was built in tribute to Shaikh Salim Chisti, the Sufi saint who correctly predicted the birth of Akbar's son and heir, Prince Salim (the future Emperor Jahangir). The original structure, finished in red sandstone, was completed in 1581, but in the early 17th century, the marble exterior of the present-day structure was added at the behest of Emperor Jahangir. The square mausoleum (measuring 48 feet on each side) is topped by a single dome with a porch entrance on its south side. Broad slanting eaves, supported by intricately carved serpentine brackets, stretch around the top of the entire structure. Inside, the tomb's main chamber is enclosed by white marble lattice screens and at its center is the saint's tomb covered by a canopy inlaid with mother–of–pearl and ebony. Verses from the Qu'ran ornament the outer walls of the tomb chamber and its marble floor is inlaid with semiprecious stones. Din–i–Ilahi or "divine faith," describes the religious teachings developed by the third emperor of the Mughal Empire, Akbar the Great, in the late–16th century. Akbar's teachings had their foundations in regular discussions at the Ibadat Khana, "The House of Worship," in Fatehpur Sikri, where he hosted religious leaders and theologians of various faiths, including Hindus, Muslims, Christians and Jains. Seeking a common ground among religions, his teachings synthesize ideas from multiple faiths, do not have a sacred scripture and include a form of sun–worship that reflects Hindu and Zoroastrian influences. Virtues of celibacy, kindness and piety are encouraged, and vices of lust and pride are condemned. Despite transcendent aims, Din–i–Ilahi centered primarily on Akbar as a divine personage and did not attract many followers outside the realm of Akbar's court. The large courtyard, adjacent to the Girl's School, is designed as a playing board for the Indian game Pachisi, from which Parcheesi is derived. Slave girls are thought to have been used as the life-size playing pieces for the game, but whether the courtyard was extant during Akbar's reign is still in doubt. Although some sources have identified this bi-level structure as a school, its exact function is not absolutely known. The open main floor is comprised of more than 100 pillars, while the top story features a smaller, walled enclosure. The tallest building at Fatehpur Sikri, the Panch Mahal is five stories high, has no walls, and is supported by a multitude of intricately carved pillars. 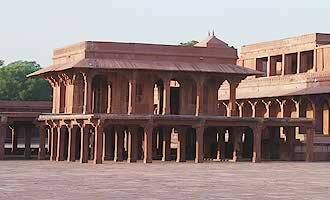 Like the other structures in the complex, it is made of red sandstone quarried in the area, known as Sikri sandstone. The size of each story and the number of pillars it comprises decreases as the building rises, but the structure's total height is equal to the length of its ground floor. There are 84 columns on the bottom story, 56 on the second, 20 on the third, 12 on the fourth, and at the top, the square chattri (domed kiosk) is supported by four columns. A latticed balustrade wraps around the edge of two stories (the second and fourth), while three stories (the third, fourth, and fifth) are covered by an overhanging eave (chhajja). Also known as "badgir," or wind tower, the building's design is open to the breeze and it's thought to have been used as a place to cool off during the heat of the summer months. The entire expanse of the imperial city is visible from the top floor, from where Akbar could see and be seen by his subjects. What do the large number of monumental buildings tell us about the power and rule of Akbar? What aspects of Akbar's rule do we still value today? 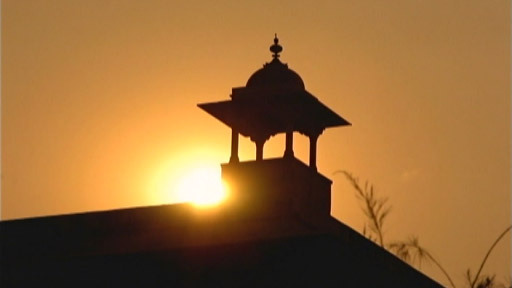 Do you think Akbar's idea of a universal religion (Din-i-Ilahi) could work in modern times? Why or why not? Why did it not grow under the rule of Akbar? Compare the achievements of Akbar and Ashoka. What attributes did they share? What led to the decline and eventual fall of the Mughal Empire?